If you miss the Teen Titans animated series of the early 2000s, then the upcoming DC animated film, Teen Titans: The Judas Contract should put a smile on your face. They've loosely adapted the classic "Judas" storyline from the comics and made this direct-to-video feature PG-13 with a similar tone to the old cartoon with new costume designs but keeping a sense of humor. The current animated iteration on television,"Teen Titans Go!," is great but geared toward younger viewers. The 2003 series had a darker serious tone due to the recurring clashes with conniving villain Deathstroke. It was able to mix some humor using the chemistry of the great voice talent. Here, the voice of Slade Wilson is by beloved veteran actor Miguel Ferrer who sadly, recently passed away. 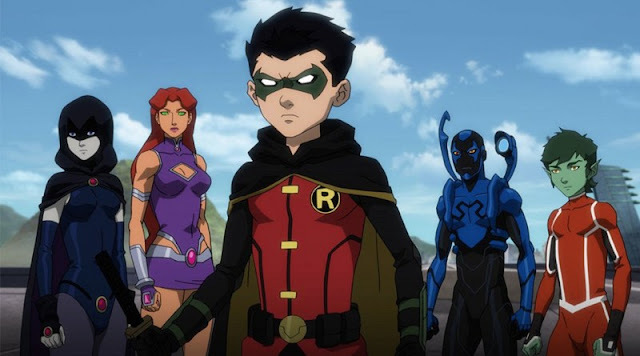 Other voice talents and their characters include Terra (Christina Ricci), Nightwing (Sean Maher), Starfire (Kari Wahlgren), Raven (Taissa Farmiga), Beast Boy (Brandon Soo Hoo), Blue Beetle (Jake T. Austin), and Robin/Damian Wayne (Stuart Allan). Teen Titans: The Judas Contract is directed by Sam Liu, from a story by Ernie Altbacker, and screenplay by Altbacker and J. M. DeMatteis. Look for it on Blu-ray, DVD, and Digital HD this spring.